Curious about a lawyer's portfolio performance? Let's take a look at my portfolio and see how well it's done over the past year. Every year during my birthday month I take a look at my portfolio performance from the previous year and make any adjustments necessary to keep things running smoothly for the next year. This year had its fair share of significant changes in the portfolio. 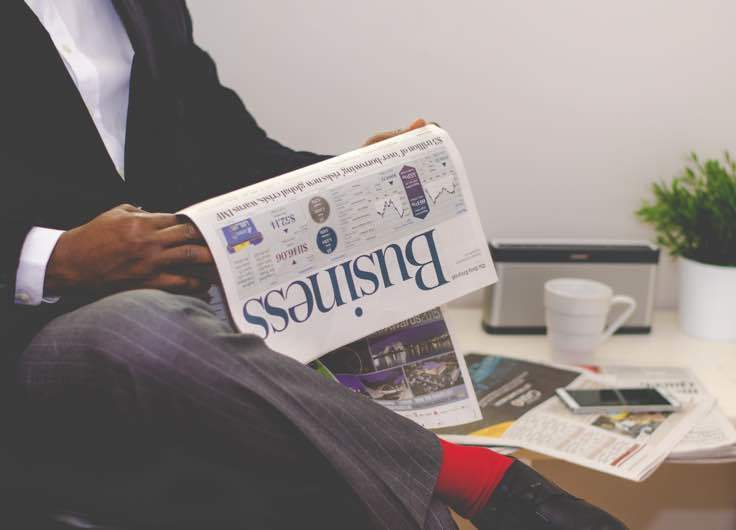 In 2017 we were worried about the possibility of rising interest rates, political upheaval, changes to the tax code and plenty of other topics that dominated the news. But at the end of the day, is all of that just noise? We only really care about our actual returns. So how did we do? Before we measure the returns, let’s take a look at the Biglaw Investor portfolio as it stands today. There were a lot of personal changes last year too (I got married). The below portfolio represents our combined retirement accounts, which means it’s out of whack as compared to the Biglaw Investor portfolio I shared with you previously. 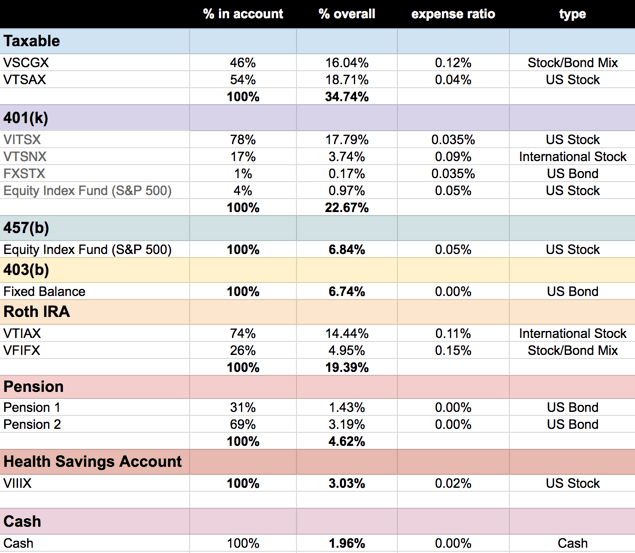 The retirement spreadsheet includes our taxable accounts, 401(k)s, 457(b), 403(b) and IRAs. That’s an alphabet soup of accounts! For the sake of simplicity, I combined everything rather than also listing out the separate spousal accounts but keep in mind that each spouse has a separate retirement account. Not included in the above are assets like savings accounts devoted to specific purposes (buying cars, a house or 529s). Q: What’s VCSGX and why do you own it? The Vanguard LifeStrategy Conservative Growth Fund (VSCGX) is a 40/60 mix of stock and bonds. During the early part of my career, I created a “Biglaw Eject Button” in case I ever wanted to leave Biglaw immediately. Thanks to the growth of the fund, I’ve locked in some significant capital gains. I don’t want to sell this and trigger those taxes so theoretically this should represent the entirety of my bond position (the stock portion is a mix of the total US stock market and the entire International stock market). I’m not investing any new money into this fund. Q: What is the Equity Index Fund and the Fixed Balance Fund? My wife works for the government. Her retirement accounts don’t include traditional mutual funds. The equity index fund essentially tracks the S&P 500 at a low 0.05% expense ratio. The fixed balance fund is an oddity that we cherish. It pays a guaranteed 8.25% return. I classify it as a bond when calculating our asset allocation. We can’t get enough of this fund. Q: What are the two pensions listed? My wife’s government job forces her to contribute a portion of her salary to a pension. Should the pension not vest, we will roll the money in these accounts into an IRA. Meanwhile, we’re earning 5% on these funds. I treat them like bonds when calculating our asset allocation. Now that you have an understanding of our portfolio, how did it do last year? Let’s compare the You Index™ representing my entire portfolio plotted against the S&P 500. Looks like I just barely trailed the S&P 500 last year! The 2.25% likely represents the part of our portfolio devoted to bonds. I’m also not wholly convinced that Personal Capital accurately tracks the return of my wife’s retirement accounts since they are manually entered but that’s okay. This is close enough. But wait. Something’s not right. Apparently Personal Capital wants you to think you’re doing better than you are. They include the S&P 500 return without reinvesting dividends, which is silly since we’re not just interested in how much the total value of the S&P 500 changed during the year. We also want to include the dividends received as part of our return. 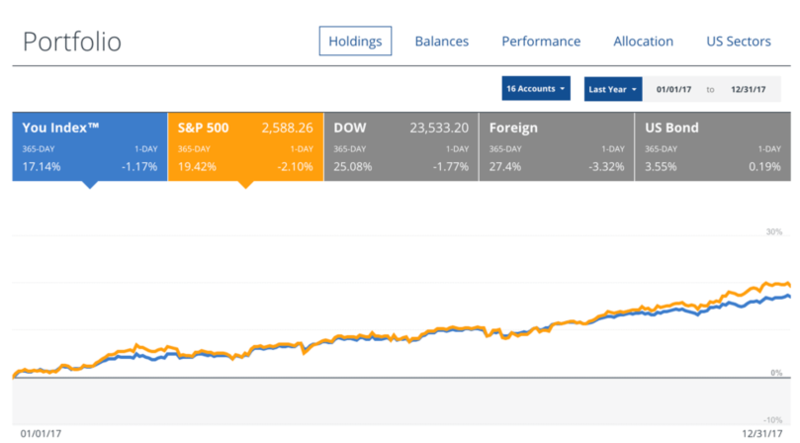 Including dividends, the S&P 500 returned 21.83% in 2017, meaning our portfolio trailed by 4.69%. That’s starting to get a little worrisome as I’m not intending to have a bond-heavy portfolio, so we don’t want to lag the total equity market by too much. As mentioned above, this year we combined finances, so perhaps it’s time to take another look at the asset allocation (look for that in a future post). International stocks had a bumper year with VTIAX up over 27%. With a goal of keeping 20% of my portfolio in international stock, I certainly benefited from the strong performance of international stock. There aren’t any losers in this portfolio. Some mutual funds didn’t perform as well as the S&P 500, but that’s because they include bonds. As you can see from the below graph, VSCGX was up nearly 11%, trailing the S&P 500 significantly. But given the 40/60 split between equity and bonds, this is to be expected. Surprisingly, VTSAX, which represents the total US stock market, slightly underperformed the S&P 500. The S&P 500 represents the vast majority of the total stock market, but if you want to pick up the other 20% of the market, you need a tool that tracks the overall stock market. Since the bottom 20% of the market represents small cap “growth” companies, I typically think that the entire stock market will perform better than the S&P 500. That was not the case in 2017. The S&P 500 returned 21.83% including dividends, but VTSAX eked out 21.16%. Here’s to hoping that the trend doesn’t repeat itself next year! I’d say it was a great year. A 17.14% return is fantastic and something I’d hope for every year. At that rate of return, you’d see your money double nearly every four years (although you can double it faster by saving more money). What’s not to like about watching your money double? These returns are well above historical average and significantly higher than many investors predicted for the course of the next decade. What will the future hold? I have no idea, but I plan to be riding the market and taking what it gives me. We are accumulating money in a separate cash account for an eventual home/investment property purchase, so there will be smaller contributions to the taxable account this year (although I often deposit small amounts of “found” money into taxable whenever I get the change (e.g., when I recently sold an old laptop)). Also, I need to clean up our asset allocation. I had my portfolio dialed in precisely as to how I wanted it but adding a wife to the equation moved us into different territory (i.e., much more “bond” heavy thanks to “bonds” that pay 8.25% guaranteed each year, so it’s hard to complain too much). As such, we probably need to take on more equities. This year all of our retirement account contributions have been devoted exclusively to equities except for the Fixed Balance Fund. I’ll have a future post up soon detailing how I moved around the balances a bit to get us closer to our desired asset allocation. Let’s talk about it. How did your portfolio do in 2017? How I Protect Myself When Renting a CarLions, Tigers and Bonds, Oh My! Have you ever thought about buying investment property with your Roth IRA? I have an uncle who works for Empower and has done this. I find it intriguing and attractive. The downside is that you technically aren’t supposed to ever stay there or rent out for free. Yes, I’ve considered investing in real estate via a Roth IRA. For now, I’m more comfortable using retirement accounts for traditional investments (stocks and bonds). At some point I expect to start taking on some leverage with my other investments. Like a typical conservative lawyer, I’ve mainly been opposed to taking on leverage and spent most of the first few years trying to de-leverage myself by paying off the student loans. I slept much better once that $200K was paid back.